We’d taken a rare evening away from our first-born to catch the opening night of the film “The Passion of the Christ” with friends from church. Of course I knew what would happen, but seeing the events of Good Friday unfold so realistically on the silver screen left me dumbfounded. Watching Jesus—beaten, bloodied, tortured, and suffering because of my sins—was nearly unbearable. I found myself wincing and averting my eyes several times as the story unfolded. While the final credits rolled, I sat in somber silence. My gut instinct—what I honestly wanted to do in that moment—was to fall prostrate on the ground (regardless the disgustingly sticky theater floor) both in profound remorse for my sinfulness and with limitless gratitude for the gift of salvation made available through the power of the Cross. And yet I stayed seated in my chair. I eventually gathered my belongings and left the theater with our friends, just as was expected of me. The moment passed. In today’s Gospel, ten lepers meet the Lord and cry out, “Jesus, Master, have mercy on us!” (Luke 17:13) Our Lord takes pity on them, and completely heals them all, yet only one returns to show gratitude for the gift he has received. He realizes that he owes everything to Jesus Christ and, in that moment, praises and thanks the Giver of all good gifts. Oh, my heart aches to think of just how often I see myself in the lepers who never returned—the ones who were healed, yet failed to show gratitude even after their cries for mercy were answered. I cry out to Jesus all the time—for various intentions, for healing, and, ultimately, salvation itself—yet, how often do I return to express my gratitude? 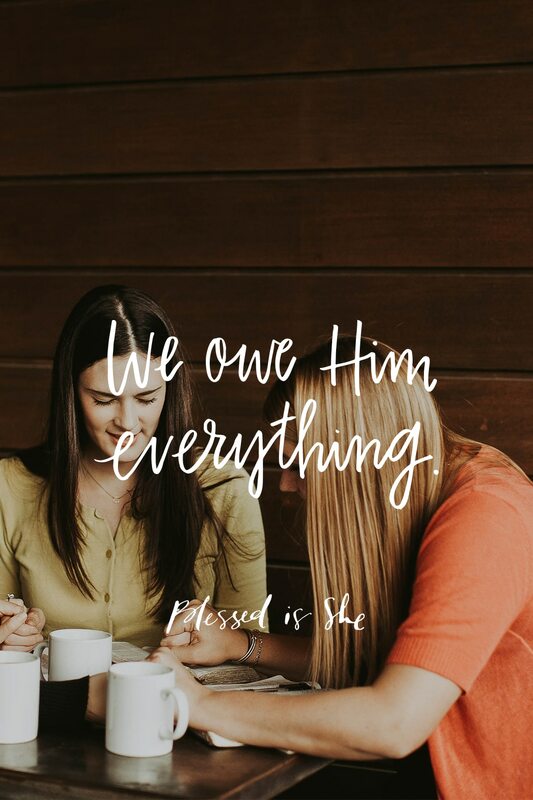 I owe Him everything, yet, all too often, I move on to the next thing without thanking Him, and I allow the moment to pass. As Thanksgiving Day is celebrated in the United States today, let’s not just move on. Let’s take some dedicated and intentional time to humbly and sincerely praise and thank God for all He has given us. Let us remember we owe Him everything. Thank you such a good reminder of how I often so quickly move to the next struggle in my day without thanking our Lord for His Mercy , forgiveness & love when I call upon Him in need . I may be wrong, but I think the wrong devotional got matched up with the readings! Hi Sarah! We write off all the readings available for today on the USCCB website, so if you check over there, it will correspond. Thank you! Hi Holly! We write off the readings available on the full USCCB site for the day. If you hop over, you’ll see it. I think that the devotional was written for the Thanksgiving Day mass readings, and the readings themselves pulled from the ordinary readings for 11/23. I love the gospel of the 10 lepers!